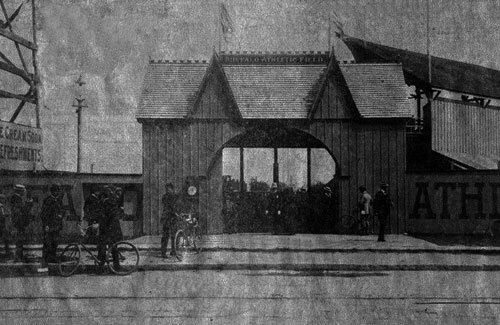 The 1897 Buffalo football season was a huge success. The team, under head coach C. W. Dibble, was a perfect 7-0 against collegiate foes and 9-1 overall for the year. Their only loss was to the local All-Buffalo club team. The Buffalo offense, lead by team captain Billy Bott, scored 188 points. The 7-0 season in itself makes for interesting Buffalo history. But if one does a bit of research on C.W. Dibble’s and Billy Bott’s personal history, you will find two, still-relevant, background stories of sports-related brain trauma and player/owner lawsuits. Condit Woodhull “C.W.” (a.k.a Billy) Dibble, the Buffalo coach, was a star athlete from a prominent family from Perry, NY in Wyoming County. He played football as a halfback at Lawrenceville School, a prep school in New Jersey. At Lawrenceville he became one of the school’s all-time football heroes. His speed and prowess as a halfback won him the name of “Flash” Dibble. His success was celebrated in an Owen Johnson novel entitled The Varmint of life at Lawrenceville. Dibble was treated by Dr. Floyd S. Crego, a prominent Buffalo, NY “alienist” (an archaic term for a psychiatrist) from the University of Buffalo.3 Dr. Crego would gain some notoriety in 1901 for evaluating Leon Czolgosz, President McKinley’s assassin, finding him sane and fit for trial. Dibble was eventually “cured” by Dr. Crego in June 1897.4 In the fall of 1897, Dibble joined the University of Buffalo football team. 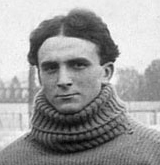 Although still wanting to continue to play, he agreed to become the coach when Fred Townsend quit two games into the season. His playing days seemingly over before his 22nd birthday. After the exceptional 1897 football season, Dibble left the University of Buffalo. Dibble would later have a successful career in finance. But due to his head injury, he never graduated from college. During the summer of 1896, Billy played semi-professional baseball for the Geneseo All-College team. Billy was the star pitcher paid for his effective “curve” balls. The Geneseo, NY team was owned by U.S. Congressman James W. Wadsworth, Sr., a Republican Representative from New York. Dr. William J. Bott married Miss Edith Mclntyre of Palmyra in 1902. He went on to have a long medical career. Charles P. Norton, Bott’s lawyer, would later become the sixth Chancellor of the University of Buffalo holding the office from 1905-1920. “Halfback Dibble Insane” Ithaca Daily News – 19 October 1896. “Queer Freak of Memory” New York World – 1 May 1897. “Very Strange Case of Condit Dibble” Buffalo Express – 4 June 1897. “Dibble’s Lost Memory Restored” New York Times – 4 June 1897. “Congressman Wadsworth Sued” New York Sun – 13 January 1899. “Billy Bott vs. Congressman Wadsworth” Avon Herald – 18 January 1899. “University of Buffalo Won” Rochester Democrat & Chronicle, Rochester, NY, 3 October 1897. “Great Fall Game” Morning Herald, Utica, NY, 11 October 1897. “Buffalo Won Easily” Buffalo Express, Buffalo, NY, 17 October 1897. “Union A Mark” Syracuse Daily Journal, Syracuse, NY, 21 October 1897. “Other Football Results” Morning Herald, Utica, NY, 25 October 1897. “U. of B. Downed in Second Game with Local Rival” Buffalo Express, Buffalo, NY, 3 November 1897. “Did Not Even Score” Buffalo Express, Buffalo, NY, 7 November 1897. “Saturday’s Football Games” Auburn Bulletin, Auburn, NY, 15 November 1897. “U. of B. Challenge” Buffalo News, Buffalo, NY, 17 November 1897. “Sanford Could Not Save ‘Em!” Buffalo News, Buffalo, NY, 24 November 1897. “Buffalo Defeats Hobart” Evening News, North Tonawanda, NY, 26 November 1897. Student Dibble Recalls All Save Faces of Friends at Home. MIND IS BRIGHT AND CLEAR. He Is in Good Health and Stands Well in His Classes at Williams College. A FALL CAUSES THE LAPSE. Dibble Is Now Employed in Making the Acquaintance of Those He Has Known for Years. BUFFALO, April 30 – Cases of loss of memory are common enough, but the case of Condit Dibble, of Perry, Wyoming County, is remarkable in many ways. Mr. Dibble is about twenty-two years old, the son of the Presbyterian minister at Perry, fifty miles from Buffalo. He is a student at Williams College and was regarded as the coming half-back of the football eleven. Last fall he sprained his ankle while in practice and was unable to play in any of the Williams games. While walking on the college grounds his cane broke, and in trying to keep his weight off his injured foot he fell and struck his head. He suffered congestion of the brain. He was unconscious for about a week and was taken home for treatment. He is now in full physical health, has a good appetite and is bright in conversation and in his studies. But he has forgotten every one he knew in Perry. Outside the village he is his normal self. He remembers all his friends in Warsaw, Castile and adjoining towns, but has no recollection of having met any of his old chums in Perry. This discovery was not made until he was able to be out. Then when he walked the streets of Perry for the first time he was puzzled at the number of strangers who grasped his hand and asked about his health. This confused him greatly, and it was a shock when he was told that some of the persons whom he took to be strangers had been his companions from childhood. Every one in Perry knew the minister’s son intimately, but he in making their acquaintance over again. His faculties are impaired in no respect except as to the people of Perry, and they were one and all blotted out of his life. Dibble is now being treated at Buffalo by a well-known alienist. Meanwhile Mr. Dibble is making new acquaintances in Perry every day. He will return to college in the fall. Dr. Bott Wins His Case. 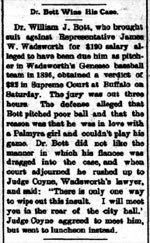 Dr. William J. Bott, who brought suit against Representative James W. Wadsworth for $190 salary alleged to have been due him as pitcher in Wadsworth’s Geneseo baseball team in 1896, obtained a verdict of $92 in Supreme Court at Buffalo on Saturday. The jury was out three hours. The defense alleged that Bott pitched poor ball and that the reason was that he was in love with a Palmyra girl and couldn’t play his game. Dr. Bott did not like the manner in which his fiancee was dragged into the case, and when court adjourned he rushed up to Judge Coyne, Wadsworth’s lawyer, and said: “There is only one way to wipe out this insult. I will meet you in the rear of the city hall.’ Judge Coyne agreed to meet him, but went to luncheon instead.